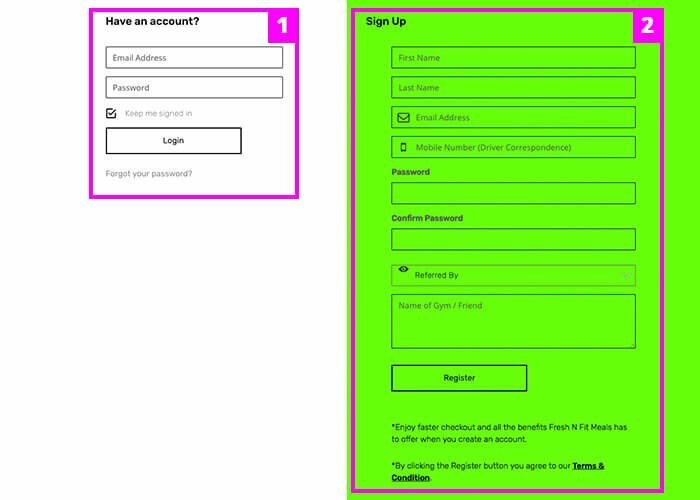 Whether you have created an account with us already or are signing up for the first time, you can click on the LOGIN/REGISTER button on the top left of your screen to do so. Here you can sign into your account if you have created one previously. You will be required to fill out this information if you are creating an account for the first time. From the home page (or top navigation), you can select any of our meal options. In this case, we will be showing you the CUSTOMER CHOICE section. 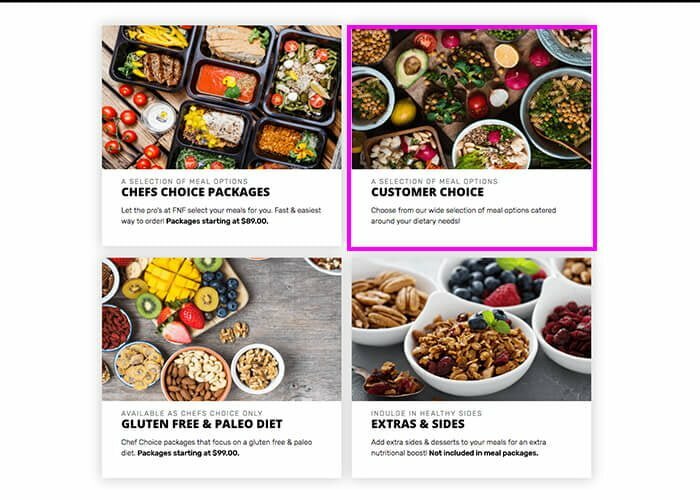 From the CUSTOMER CHOICE PAGE, we will be showing an example of how to order through YOUR CHOICE packages. 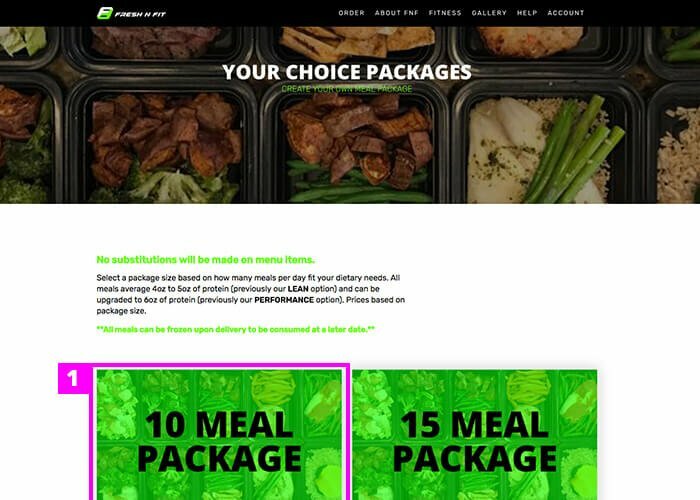 Now that we are on YOUR CHOICE packages, we will select a meal package size. 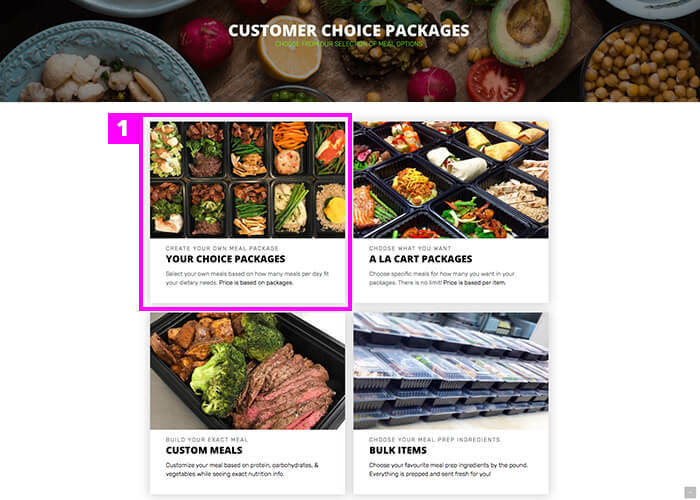 In this case we are choosing a 10 MEAL Package. Once you are in the meal page, you will see a large selection of menu items to choose from, ranging from our weekly menu, signature meals, & breakfast meals. When you have selected your desired meals, simply add the order to your cart. 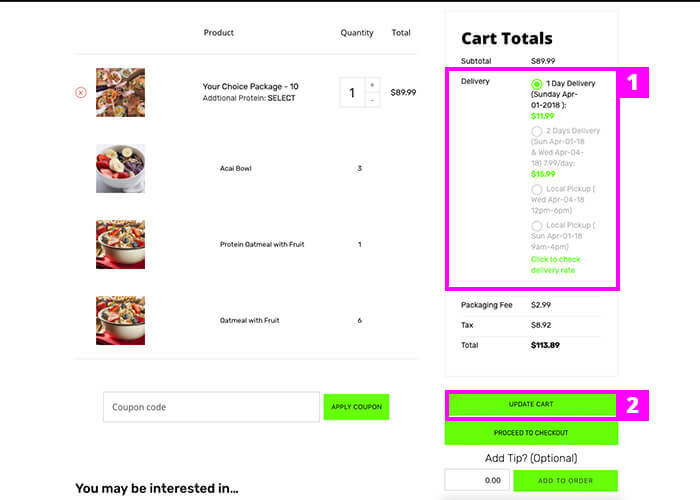 By clicking the quantity button, this will increase the size of the specific item you desire in your meal order. 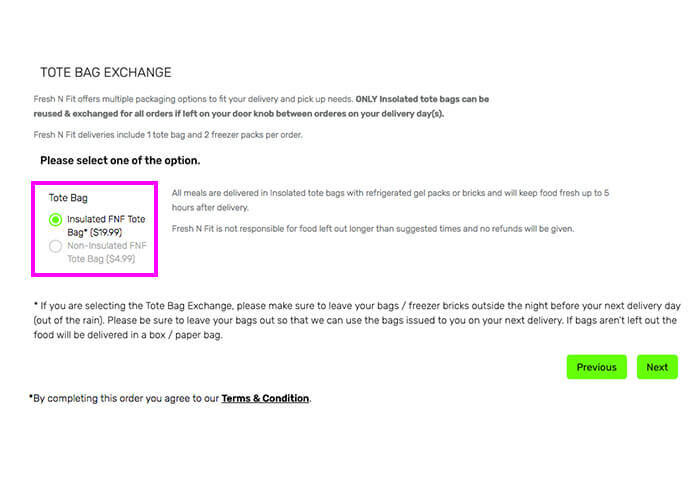 This is the package details panel, which can be found on the bottom of the page. 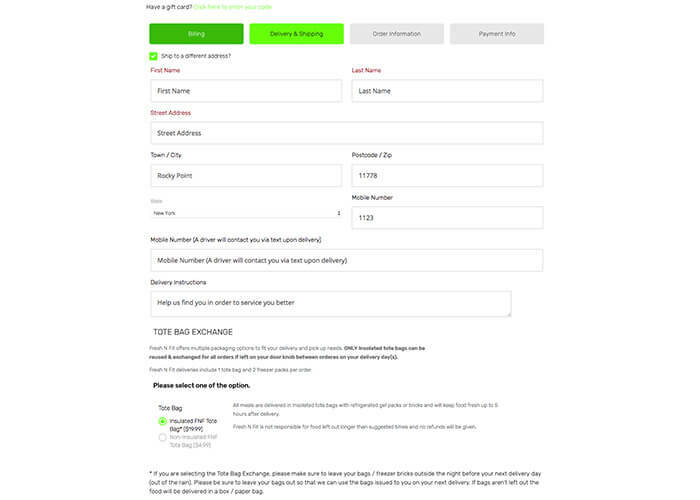 You can view the price of your package, as well as any additional prices. You will be able to add roughly 1-2 oz. of extra protein to each meal for $1.00 extra per meal. 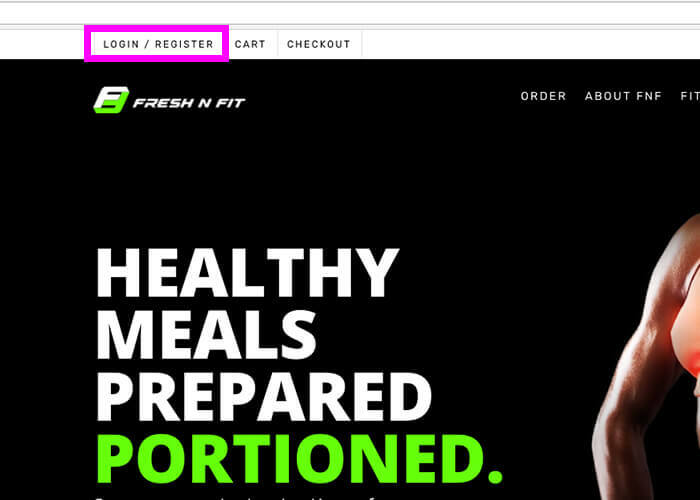 You will then be redirected to the cart page, where you can checkout or continue to add more delicious meals to your order! 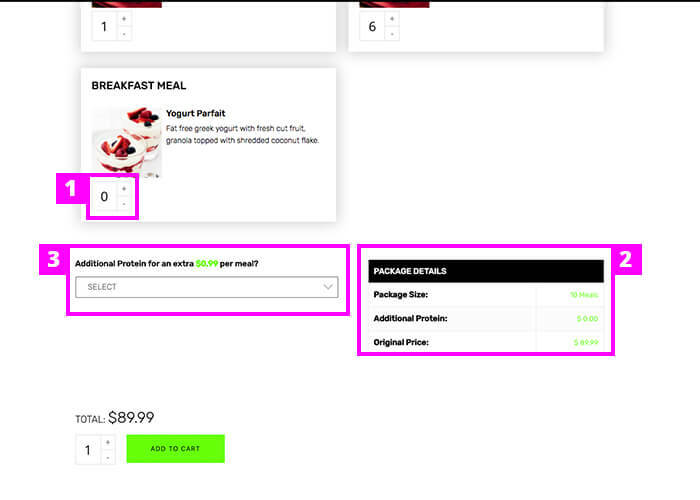 Important Note: Your cart must have at least $89.99 meal value for your total order to be able to checkout. Before your checkout, you have the ability to choose the type of delivery you would like. If your address is considered in our shipping zones or out of state, this section will reflect that. You can read more about our delivery & shipping here. 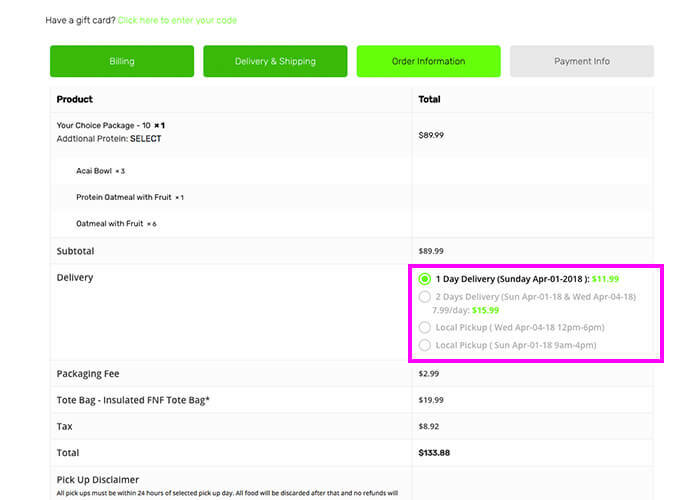 Once you have selected your delivery method, please update your cart to see the reflected change in your order total. 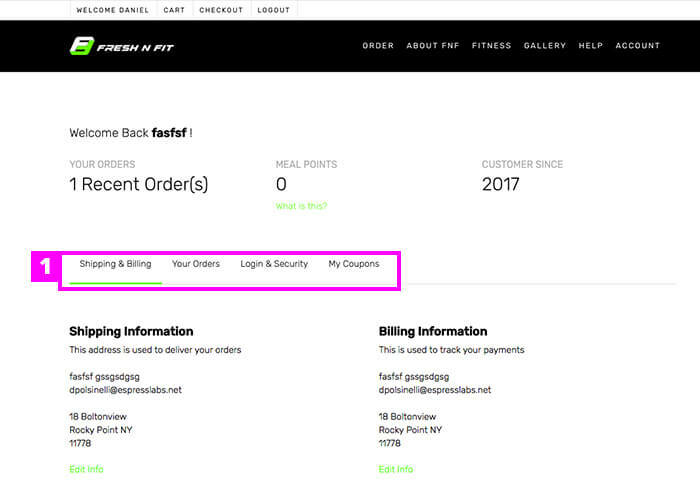 You will be able to change your delivery method in the checkout as well. You must complete each step in order to complete your order. This section is for your billing address. Your information will be auto-filled if you have already added in your information on the account screen. This section is for your delivery / shipping & Tote Bag Exchange. Your information will be auto-filled if you have already added in your information on the account screen. This is our recommended choice when transporting meals as it keeps your orders fresh for up to 5 hours upon delivery. This is a great option for people who are worried about not being home for meal deliveries. This is our secondary option for people who want a cheaper alternative. This option will only keep food fresh for up to 2 hours upon delivery. This option will become available in this section once you have placed an order with us and have purchased an insulated tote-bag. Please be sure to leave your bags out so that we can use the bags issued to you on your next delivery. If bags aren’t left out the food will be delivered in a box / paper bag. In the ORDER INFORMATION tab, you will be able to review your full order as well as change your delivery information if need be. This is the last step in your order process. 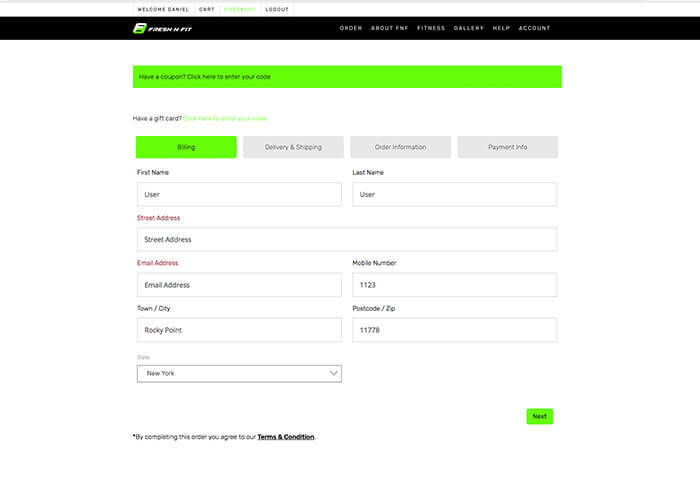 Once you click the Place Order button you would be directed to the payment portal. This is the last step in your order process. 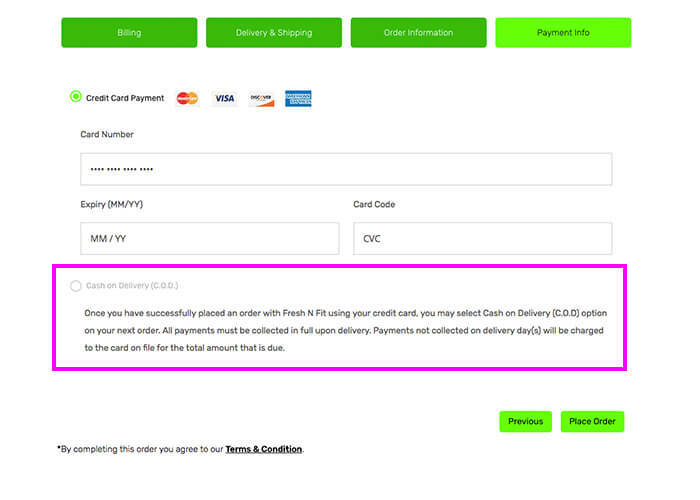 Once you have completed one order, you will be able to select the Cash on Delivery (C.O.D.) option. Cash on delivery is another way we allow customers to pay if they plan on being home for the delivery. Payments not collected upon delivery will be charged to the card on file for the total amount that is due.